How do Japanese people honour miscarriage? In the most touching way. The touching way the Japanese honour miscarriage. When my friend miscarried she was bereft and uncertain what to do. After weeks of loving that baby growing inside of her she couldn’t face it just being treated like medical waste. So she called her parish priest and asked him to bless what remained of her child. “I’ve never done a miscarriage before,” he commented before saying a prayer over whatever the doctor could bring him. It’s always made me feel sad how miscarriage is treated in the medical community and it’s only been in recent years we’ve started to honour those lost children and the profound sadness those prospective parents will live with forever. Lisa Wilkinson talks about her miscarriage. Angela says she did go home but didn’t sleep and she and husband Brady struggled through their individual journeys with grief. “I had all this sorrow and no one to give it to, and Brady couldn’t take it off me because his hands were already full of his own mourning,” she wrote. That’s when she and husband Brady remembered an experience they had while travelling through Japan. They were on a date in a cemetery in Japan at Mount Koya that doubles as a tourist destination. What captured her attention was hundreds of “Jizo statues” lining the path. In Japan, a Jizo represents the souls of babies who are never born. That’s what she wanted. A physical representation of her child, the grief and the loss. She needed something to give her grief to. Angela and her husband ordered a Jizo statue on the internet. Buddhist &apos;Jizo&apos; statues represent babies who have never been born. Image: iStock. Buddhists believe a baby who is never born can&apos;t go to heaven because they haven&apos;t had an opportunity to accumulate good karma, and the role of the Jizo is to sneak them into paradise in &apos;his&apos; pockets and deliver the toys and snacks left at his feet. "It was nice for us to have something to do, a project to finish in lieu of the baby I failed to complete." Angela writes. "When Jizo was dressed, Brady complimented my handiwork. &apos;Where should we put him? In the yard?,&apos; he asked." But Angela wasn&apos;t ready to be that far away from him yet so she set about crocheting a little red hat and kept him in the kitchen. The colour red is traditionally used to adorn statues and gods in Japanese culture because it is a colour that represents power. In the case of miscarriage, the power of a mother&apos;s love. She describes kissing it and talking to it as she went about her day. Eventually she moved it to the front porch. Mamamia podcast This Glorious Mess, on how men grieve differently after the loss of a child. "It was crazy to fuss over a statue like I did. But I felt crazy, which could have been from the pregnancy hormones still coursing rudely through my body. Or maybe it was the lack of traditions surrounding miscarriage in the States that gave me nothing to take the edge off my grief. Without a prescribed course for mourning, I didn’t know what else to do besides mother this lump of concrete as if he could actually transfer my love to the afterlife." 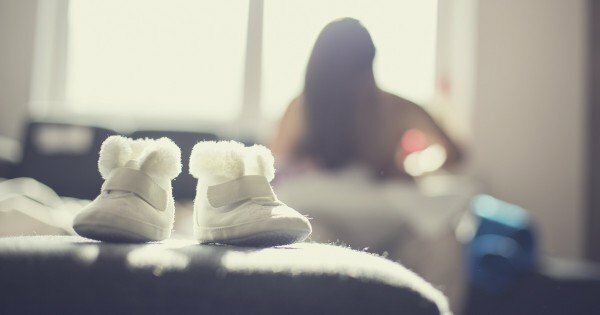 What do we do with all of that love and joy and hope we had while pregnant, and how do we deal with the physical and mental effects of miscarriage, of a mind and body that was expecting a baby and yet there isn&apos;t one? Angela says, "I’m not sure if this is the correct way to weather a miscarriage, or even the right way to Jizo. I don’t know how long I’m supposed to crochet new outfits: maybe until I don’t feel the need to, or maybe forever." At least she and her husband had something to represent their incredible loss, a way to pour out their grief not on each other, but somewhere, to someone. She ended by saying, "Brady and I will always think of that baby who never was. We’ll leave pieces of our love for him wherever we go, hoping Jizo will deliver them to wherever he is." Angela Elson lives in Seattle and is writing a memoir about the year she spent teaching English and finding love in Japan. If you or someone you know is struggling to cope after the loss of a child contact SANDS (miscarriage, stillbirth and newborn death support) via their website. In 2014 parents Emily and Richard shared photos of still born daughter Monroe through Lindsey Natzic-Villatoro of Love Song Events and Photography. In Australia you can contact Heartfelt for a similar service.